A new research vessel that will help faculty and students at Florida Institute of Technology and other Florida universities conduct marine research and tackle some of the state’s most vexing issues, from hurricane erosion to red tide, will make its first visit to Brevard County on Jan. 22, 2018. The public is invited to tour the R/V W. T. Hogarth during its stop in Port Canaveral, the second of 10 visits planned at ports around Florida through late March. The ship will be open for public tours from 2-4 p.m. at Ocean Club Marina, 930 Mullet Road. Named after William Hogarth, the marine research scientist who served as director of the Florida Institute of Oceanography (FIO) from 2011 to 2016 and was former dean of the University of South Florida College of Marine Science, the $6 million, 78-foot, coastal-class ship was built at Duckworth Steel Boats in Tarpon Springs. It was launched May 23 and is sponsored in part by Florida Tech. As many as 800 principal investigators from Florida Tech and 30 other Florida universities and institutions that comprise FIO will utilize the Hogarth for data collection, observations and research. 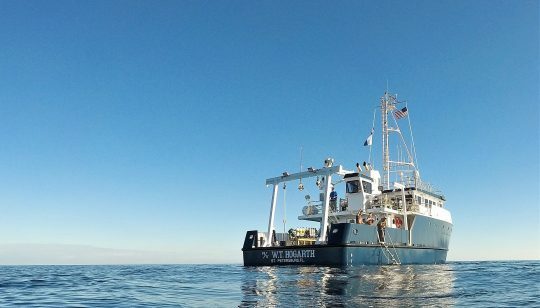 Equipped with berths for 10 scientists, as well as wet and dry laboratories, satellite internet, fisheries eco-sounders, bathymetric equipment for bottom-sounding, and a dynamic positioning system, the R/V W.T. Hogarth has already garnered attention for her advanced technology for use in studying oil spills, red tides and other environmental concerns. For more information on the R/V W.T. Hogarth, including photos and video, visit http://www.fio.usf.edu/vessels/rv-construction.